Under the laws in Oregon, certain individuals on the road are described as “vulnerable user[s] of a public way.” These individuals include farm tractors; skateboarders, roller-skaters, inline-skaters, people on scooters, and bicyclists. Individuals within these categories are considered vulnerable because they have an increased chance of being severely harmed in a collision. Motorists are expected to treat these vulnerable road users with respect and take reasonable steps to avoid an accident. Car accident lawyers in Portland, OR know that drivers who cause serious injury to vulnerable road users can face criminal charges if their actions were negligent or intentionally harmful to the person on the road. Drivers can also face civil liability if they cause injury, which means they can be sued by the person they hurt through their negligence. According to Oregon Live, a 64-year-old truck driver was issued a citation in mid-September in connection with a bicycle accident that occurred in late August. The bicycle accident involved a 16-year-old boy who was biking near the intersection of Southeast Seventh Avenue and Taylor Street. A tow truck driver in the vicinity reportedly hit the bicyclist, leaving him with injuries that were described as non-life threatening. Instead of stopping to help the young man he had hit, the tow truck driver drove away and left the scene of the accident. The driver of the truck should have stopped after the crash to make sure the victim was OK, but he didn’t. Oregon Live now reports that he faces criminal charges for leaving the scene of the accident. The driver has also been cited for careless driving and for causing serious injury to a vulnerable road user. It is unclear what criminal penalties he will face as a result of his citations. However, the fact that he was cited for these legal violations could be helpful to the injured bicyclist if he wishes to take legal action. Motorists involved must stop and offer assistance to all accident victims. This is particularly true when a collisions involves a bicyclist or a pedestrian, as the resultant injuries may be more serious. 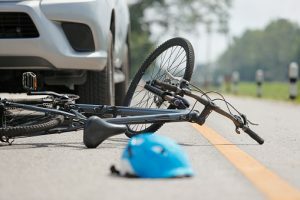 An injured victim in a bike accident case needs to prove that the other driver was negligent or breached a legal duty in order to recover compensation. Being able to show that the driver was cited for being careless and causing injury to a vulnerable road user can be very helpful to a plaintiff in proving his case or negotiating a favorable settlement.